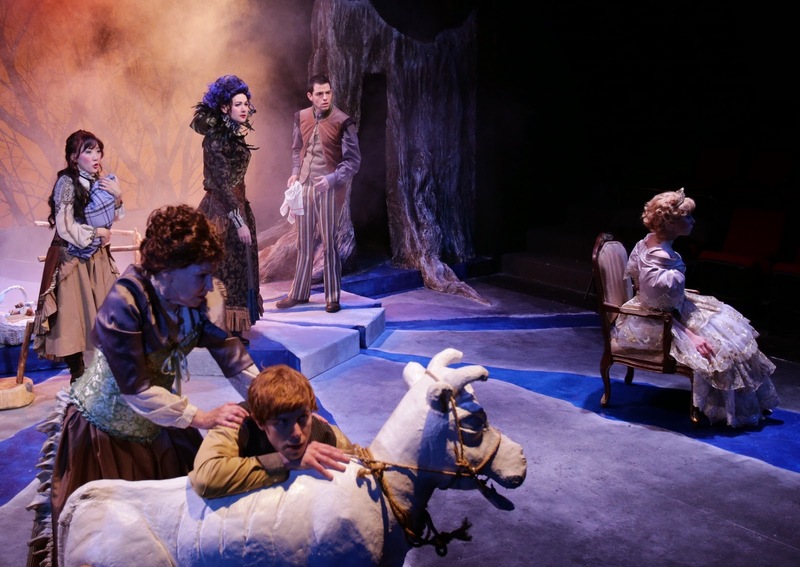 The talented cast of Into the Woods confronts a dream come true. Photo: Mark S. Howard. You're thinking, "Do I really need to see Into the Woods again?" And the answer is: Yes, you do. Because the current version at the Lyric Stage (extended through June 29) may actually be the most satisfying of the local bows this Sondheim classic has taken. 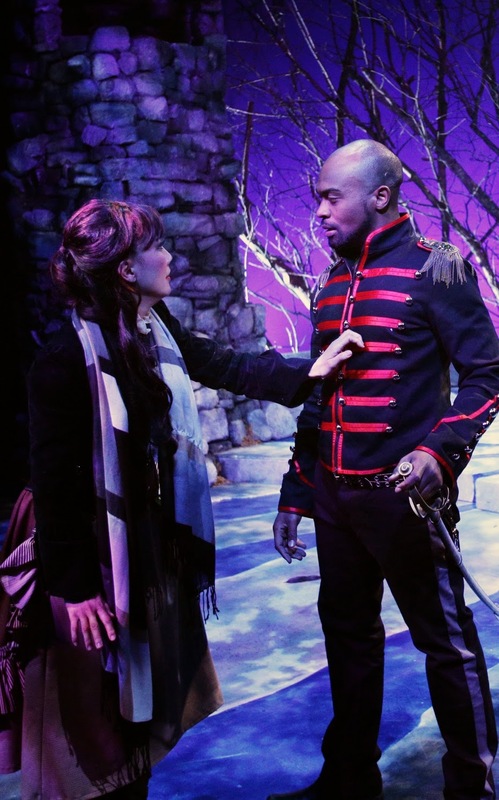 What's more, it feels like a small thematic advance on other recent versions; thanks to inspired direction by Spiro Veloudos, and the talents of an expertly cast ensemble, new insights seem to shimmer among its enchanted glades. So call this version Into the Reboot, or Woods 2.0; the life of any great text depends on a process of cultural revision, and this production may just count as our first "millennial" Into the Woods. Although Veloudos is only picking up on a widespread re-interpretive trend (indeed, he incorporates a brilliant gambit for one song, "The Last Midnight," that co-creator James Lapine himself devised for a London revival). And certainly the narrative labyrinth of these Woods offers endless opportunities for revision (the show even trails a kind of wake of variants, including dropped and added songs, doubled - or not doubled - roles, and various second or third thoughts). Lisa Yuen and Maurice Emmanuel Parent. Indeed, the rap on Into the Woods has sometimes been that it's over-complicated - largely because Sondheim and Lapine both honor the famous thesis of Bruno Bettelheim (about how fairy tales enable kids to deal with their wishes and fears) and subvert it, by replacing the naïfs of the Brothers Grimm with a knowing crowd of strivers who do make their dreams come true, only to see them crash down on their own heads in the musical's second act. And at the Lyric, while Veloudos and company can't quite weave together the many meandering paths of Lapine's book, they do conjure a surprising sense of emotional cohesion. In the past, Into the Woods has been seen as an ironic re-appraisal of the "Me" decade - or even as a prism for the AIDS crisis. 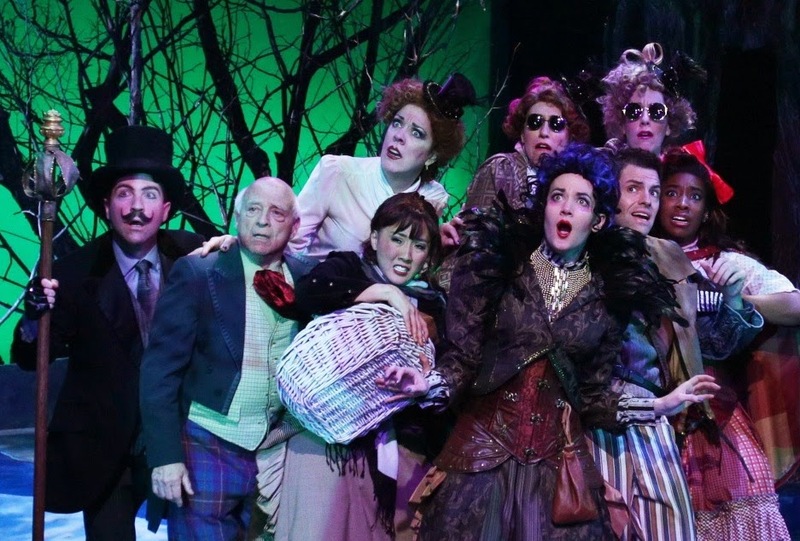 But from the beginning, Spiro's Woods 2.0 seems more centered on family ties, at least in the loose sense; emotional connections loom larger in it than wishes, and give a newfound weight to the Grimm plight of Sondheim's battered band of survivors. It helps that the Lyric stage is almost overflowing with talent this time around - although I do have one caveat about the show: the vocals range from the superb to the merely adequate; clearly for some roles Veloudos has opted for acting over singing chops. But don't worry - everyone can sing, and the discrepancies in ability disappear in the ensemble - they're only a distraction in the occasional duet. That said, I have to add this is one of the strongest Woods cast I've yet seen - not only is it solid sterling pretty much across the board, but its members snugly match each other in terms of presence and chemistry. The star of the show is, as usual, Lyric stalwart Aimee Doherty, who is all but perfect as the Witch (and of course sings like a dream); but two other local leading ladies shine just as brightly - Erica Spyres makes her Cinderella sturdy as well as sunny, and the rarely-seen Lisa Yuen is back in a terrifically wry turn as the Baker's Wife. There's more remarkable work elsewhere in the cast. We haven't seen Sam Simahk on a local stage in some time, but he steals every scene he's in (and soars through every song) as Rapunzel's Prince; likewise the reliable Gregory Balla does something subtle and original with the role of Jack, and Maurice Emmanuel Parent all but made me lick my own chops as the Big Bad Wolf, while newcomer Maritza Bostic confidently skipped off with the role of Red Riding Hood. Will McGarrahan was also on hand, dispensing wickedly beaming bemusement as the Narrator, while Maureen Keiller was in clover throughout her comic cameo as Cinderella's Stepmother. And if you're worried that Veloudos may have been tempted to shoe-horn too large a show into the intimate confines of the Lyric - don't be. There's not much "dance" per se in Into the Woods, and what movement there is has been deftly scaled to the space. And I'm happy to report that the design is another pleasure - David Towlun's set evokes an entire world within the Lyric's limits, Johnathan Carr's projections actually conjure giants from the sky, and Elisabetta Polito's costumes are particularly imaginative and rich. All told, the Lyric's tale is close to a triumph - the kind of show that should entice even grizzled Sondheim veterans to take a return trip to the Woods. Shadows do haunt these Woods. Photos: Mark S. Howard.